If you have a dog and you have a pool, the first decision you will have to make is whether the two will mix. Do you want your pool to be a people-only recreation or do you want your dog to jump right in with you? Will your dog be allowed around the pool deck area or is the entire area out of bounds for your dog? Do you have other pets, like cats, that need to be protected from falling into the pool? The following tips will help to ensure safe water fun with your pet. Appropriate fencing. All municipalities have regulations regarding fencing if you have or want to install a backyard pool. You must comply with those regulations, but you may need even more. If you have a cat or small dog or puppy, the openings in your fence may need to be even smaller than the regulations call for. Make sure your gate is equally secure and low enough to the ground to prevent pets from squeezing underneath. Pool Alarms. Consider purchasing a pool alarm. These devices float on the water, and they will sound the alarm when the water is agitated by anyone or any pet entering the water. Swimming lessons. It’s a common misconception, but dogs do not automatically know how to swim. Some dogs are afraid of the water. 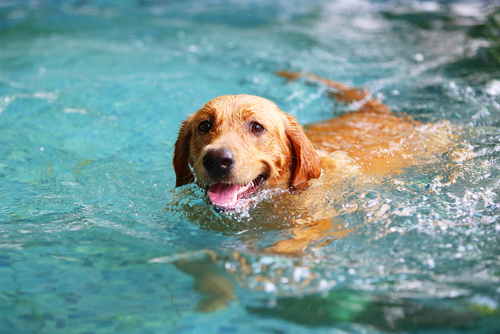 Others can dog paddle but forget to engage their hind legs, so they quickly run out of energy. 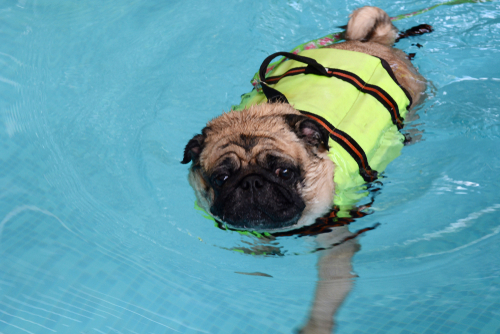 If you don’t feel competent to teach your dog, hire a trainer who specializes in water safety. Life Preservers. Some dogs, like bulldogs and corgis, have heavy stocky bodies with short little legs. They will always struggle to swim. A doggie life preserver will allow this type dog to enjoy the water. They are also useful for the dog with other issues, including arthritis and obesity. Pet CPR. The Red Cross offers an online course in dog and cat CPR. You, hopefully, will never need it, but, if you do, it could save your pet’s life. Exits. Most pool drownings occur because the dog can’t find the way out. A dog will not be able to exit the pool from the side, but, in his panic, he may expend all his energy trying. Teach your dog where the steps are, and that the steps are the way out. Carry your dog out to different spots in the pool and call him to the steps. Give lots of rewards when he gets there. Experts advise also giving your dog an extra visual clue of where the steps are by placing a large potted plant, or large sun umbrella by the steps. It will help your dog orient himself to where the steps are. If your dog can’t use the steps, or you have an above ground pool with a ladder for the exit, you can install a dog ramp for him to exit the pool. Pool Chemicals. It goes without saying that all chemicals should be stored using safety measures that ensure your pet cannot accidentally be exposed. Choose pet-safe pool chemicals when possible. Be especially vigilant when you are cleaning the pool and balancing chemicals. Dogs like to drink pool water, and a little pool water doesn’t seem to be harmful, but always have fresh water available for your pet and try to limit the amount of pool water he ingests. Heat Stroke. Dogs can get heat stroke just like people. If your dog has been in the pool or lake, his external temperature may be normal, but his core temperature could be dangerously high from chasing toys and the work it takes to swim. 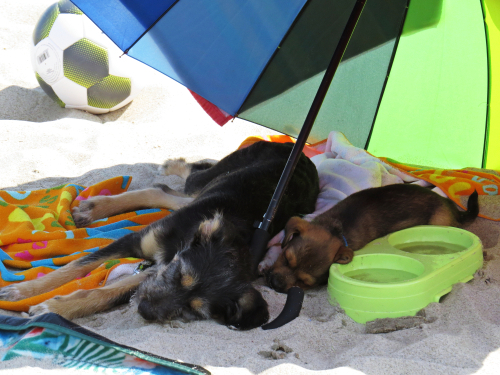 Provide water for your dog and plenty of breaks in the shade. If your dog starts having changes in his behavior and acts like he’s intoxicated when he tries to walk, put cool wet towels under his arms and run the fan while you drive to the vet. This is an emergency situation, and heat stroke can cause brain damage if not treated properly. Ear infections. If your dog spends a lot of time immersed in the water, he could be susceptible to ear infections. Always take the time to rinse your dogs with clean water after they have been in the pool or lake and make sure their ears are dry. Dogs can become sensitive to chlorine, and you can help avoid this by rinsing off your dog each time he has been in the pool. Whether your pet joins you in the water or not, pool or lake time can be the best time of the summer. Set the rules and, with a little training and a few accessories to make your dog safe, this will be the most fun for both you and your pet.